Custom-made rifles by Austrian gunsmiths Fuchs Fine Guns at Adihex 2014. Somewhat incongruously, the annual Abu Dhabi International Hunting & Equestrian Exhibition (Adihex) has become a fixed date on my calendar. Why? Two reasons, mainly. First, as it turns out, hunters are often also campers, and much of the equipment they use is of higher quality and lower price than anything an average outdoor store might stock. Second, this show brings together such a mixed bag of products, patrons and prospectors, it takes people-watching to a whole new and, at least to me, irresistible level. On the labyrinthine marketplace of Adihex, exhibitors from all over the world tout anything from live falcons and remote-controlled tents to equine treadmills and designer guns. The audience is mostly male and Arab, interspersed with a good measure of non-Arab outdoorsy types and families desperate for a 'day out' in the air-conditioned halls of the Abu Dhabi National Exhibition Center. It is extremely hot and humid out there. The best part is that you never know who you might run into and what you are going to buy. As usual, I walk away with an utterly random, firmly non-hunting selection. This year's pick: an enamel teapot, a satellite phone and a dressage whip. What also never ceases to amaze me is the participation of environmental groups, whose presence here, at an event geared towards the killing and/or racing of animals, seems a bit like those well-intentioned – but ultimately ineffectual – booths at clubbings, where health workers hand out water and earplugs to spaced-out mobs of ravers. 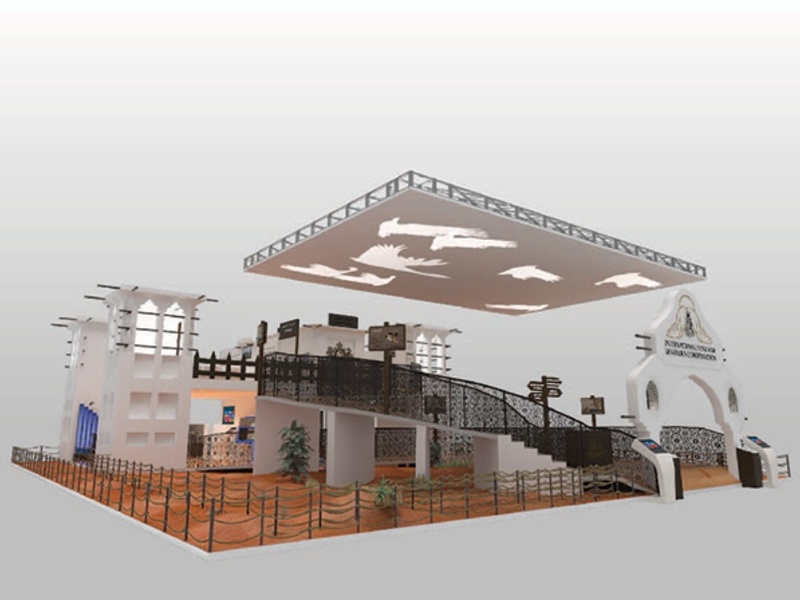 The entrance to the extensive stand of the International Fund for Houbara Conservation at Adihex 2014, complete with receptionist and signpost. A digital rendering of the stand in its entirety. Image credit: International Fund for Houbara Conservation. The houbara bustard is the prime bird of prey in falconry. To say that the relationship between falconry and houbara conservation is a contradictory one would be quite the understatement. Hunters as supporters of conservation efforts? A complex dynamic, to say the least. Meanwhile, on the other end of exhibitor spectrum: the weaponry section. I usually leave this out, but this year I decide to visit for the first time. I am uncomfortable around guns and less than enthusiastic about hunting as a pastime, but as I step through the metal detector, I try to put my reservations on hold and simply take in the scene. It is busy. Very busy. And some of the stalls are, I have to admit, totally fascinating. Take Tawazun, Abu Dhabi's own arms manufacturer, as an example. The knowledge that these weapons are designed and made in Abu Dhabi proves an odd sort of thrill and, as I stroll around the displays of sub-machine guns and hand guns, I notice many people with heavy-looking Tawazun carrier bags. An aspect of buying local I had previously not considered. Abu Dhabi-based arms manufacturer Tawazun ran one of the largest stands in the weaponry section of Adihex 2014. A chandelier, leather chairs, red velvet panelling: this stand by Fuchs Fine Guns could just as easily be selling watches or lingerie. The Twentieth Century gun collection at Adihex 2014. In total, the collection is worth USD 7.4 million (according to The National) and can only be bought as a whole. Although no sale has been announced yet, I would not be surprised if the eventual buyer hailed from the Gulf. My personal opinions on gun culture and sports hunting aside, it is fascinating to stroll through the weapons section and see how these brands present themselves; I cannot deny a certain fascination. As I have mentioned in a previous post, I have long wanted to go to IDEX, and, perhaps, this is the closest to a bona-fide Middle Eastern arms fair I am going to get. As we amble out (no metal detector at the exits), I find it slightly perplexing to see droves of visitors leaving the fair with carrier bags bearing the logos of various rifle dealers and conservation groups. This, I can't help thinking, is not the easiest circle to square.